for well over a hundred years now. 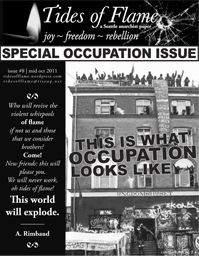 issue is of the Ungdomshuset (Youth House) in Copenhagen, Denmark. ished in 1897, and for the next decades it served as a hub for subversive activity. blem. In 1982, a group of anarchists took over the house and named it Ungdomshuset.. The Occupy Seattle protest has begun. As of this writing, people are camping out on Westlake Plaza. There is some promise in this new movement of people. 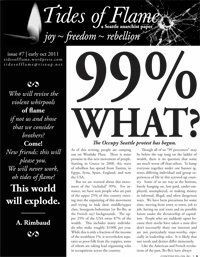 Starting in Greece in 2008, this wave of rebellion has spread from Tunisia, to Egypt, Syria, Spain, England, and now the USA. But we are worried about this movementof the “excluded” 99%. For instance, we have seen people who are part of the upper 25% of this country entering into the organizing of this movement and trying to hide their middle/upper class, bourgeois-bohemian (or Bo-Bo, as the French say) backgrounds. The upper 25% of the USA owns 87% of the wealth. This includes many individuals who make roughly $100K per year. While this is only a fraction of the income of the wealthiest 1%, it nevertheless separates us poor folk from the yuppies, some of whom are taking lead organizing roles in occupations across the country.